Bishop Simon Bruté College Seminary in Indianapolis overflowed with a youthful love for faith and fun on June 16-19 during its 10th annual Bishop Bruté Days. The four-day gathering is a retreat and camping experience sponsored by the seminary for teenage boys open to the possibility that God might be calling them to the priesthood. More than 40 teenage boys from 22 parishes across central and southern Indiana and others from the Gary, Ind., and Lafayette, Ind., dioceses participated this year. The camp’s activities included daily Mass, eucharistic adoration, opportunities for confession and presentations on the faith, as well as outdoor games and a field trip to an Indianapolis Indians baseball game. Assisting at Bishop Bruté Days were several young seminarians, not far in age from the participants themselves. Several young priests also attended and spent time at the seminary. Daniel Mapes, a member of Immaculate Conception Parish in Millhousen and a first-time participant in Bishop Bruté Days, was glad to see so many young faces among the priests and seminarians. “You can see a bunch of younger guys, a new generation of the Church,” he said. Father Michael Keucher, 29, is part of that new generation, having been ordained a priest less than two weeks before the camp. He came to the seminary on June 18 to give a presentation on the faith and be available to hear the confessions of participants. 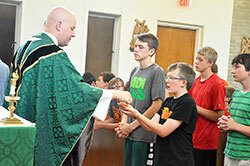 He hoped his presence and that of other young priests and seminarians might encourage the teenage boys to be open to a possible call to the priesthood. “It’s helpful for the young generation to see folks who aren’t much older than they are very alive for their faith, who have given their lives over to Jesus, and are completely happy in having done that,” Father Keucher said. “They see this joy, this love, this passion for Jesus and his Church. Nathan Herr appreciated spending time with people like Father Keucher in ordinary settings apart from liturgies and other Church-related events. “You realize that they’re really just normal people with a special calling,” said Nathan, a member of St. Patrick Parish in Chesterton, Ind., in the Gary Diocese, which sends college seminarians to Bishop Bruté. Tommy Drake, a member of Our Lady of the Greenwood Parish in Greenwood, assisted at Bishop Bruté Days as a counselor after having participated during the previous five years. Tommy, who was homeschooled and graduated from high school this spring, said that it was “the environment of all the priests and the seminarians” that kept him coming back. In addition to helping teenage boys learn more about the faith and the priesthood, Bishop Bruté Days also helps seminarians prepare for possible future life and ministry as priests. Father Robert Robeson, Bishop Bruté’s rector, has overseen Bishop Bruté Days since its inception. The experience, though, has not grown old.